The highest scoring offense in Pac-12 basketball was stifled as the No. 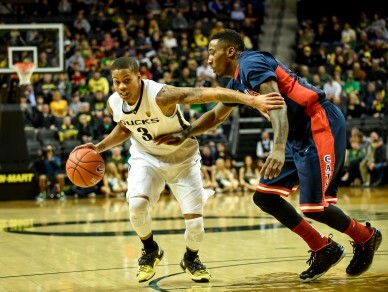 7 Arizona Wildcats defeated the Oregon Ducks 80-62 at Matthew Knight Arena on Thursday night. Sean Miller and the Wildcats have been at the top of the Pac-12 conference the last few years, and they’re poised to make another deep run in the tournament this March. Despite Arizona’s recent success, there was one thing that the Wildcats had never been able to accomplish: they had never won a game at Matthew Knight Arena. Everything changed on Thursday night, though. The Wildcats came ready to play, and their mission was to walk away victorious. The Wildcats started the game much like a championship boxer would start a match, and they came out and delivered the first punch. The Ducks were quickly put on their heels and the Wildcats took advantage by taking an early 12-2 lead. Arizona’s hot start was initiated by Kaleb Tarczewski. The Wildcats’ starting center overmatched Oregon’s interior defense with his size and strength, and his physicality was too much for the Ducks’ defense to handle, as he accumulated six points and five rebounds in the opening minutes. Oregon eventually turned up the pressure, and the Ducks’ full court press enabled them to get back into the game. Also, the Ducks lived at the charity stripe in the first half, and 10 made free-throws kept the contest close. It wasn’t enough, however, as the Wildcats’ defense displayed tremendous range and physicality, which disallowed the Ducks from getting an offensive rhythm. Arizona never trailed during the first half, and the Ducks found themselves trailing by five at halftime (39-34), despite shooting only 39 percent from the field. Arizona came out of half time and put its foot on the gas pedal, and a quick 11-3 run blew the game wide open. Once again, the Ducks faced an early deficit and they quickly found themselves trailing 50-37. Oregon showed its resiliency, however, often trimming the lead down to single digits, but the Wildcats showed why they’re one of the best teams in the nation. Their defense flew all over the floor, and Oregon had a tough time finding open shots. The majority of Oregon’s looks were contested, and even when the Ducks managed to find a lane to the basket, Arizona’s interior defense was there to disrupt the shot. Jospeh Young had one of his toughest shooting nights of the season. He shot 4 of 15 from the field. Five Wildcats scored in double figures, and Arizona was led by its senior guard T.J.McConnell, who is second in the Pac-12 in assist per game (6.07). The crafty point guard scored a game high 21 points, and he also dished out three assists and pulled down five rebounds. In the end, Arizona’s suffocating defense was too much for Oregon to handle. Oregon shot a meager 35 percent from the field, and the Wildcats’ standout defender, Rondae Hollis-Jefferson, made life difficult for Joseph Young, who leads the Pac-12 in scoring. The high-scoring senior missed 11 of his 15 shot attempts. Oregon’s head coach Dana Altman was displeased with his team’s effort, and he also credited Arizona’s physical defense. 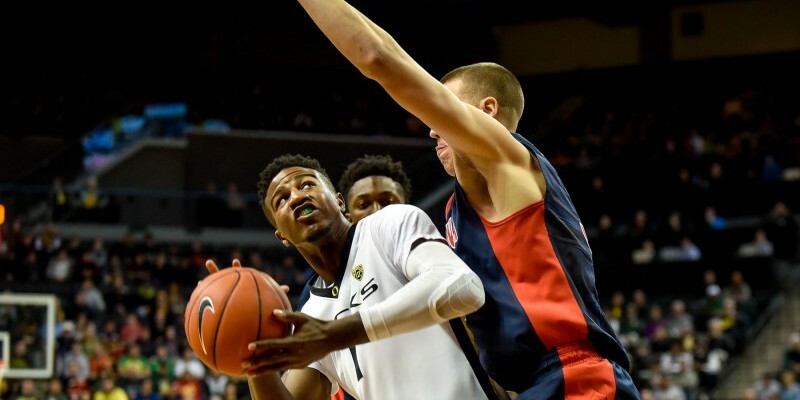 It was a tough night for the high-flying Ducks, but they will look to bounce back on Saturday afternoon when they host the Arizona State Sun Devils.